Date/Time - 30 July (Sunday), 11 a.m. Description - Telok Ayer Chinese Methodist Church invites you, your friends, and your loved ones to its Hokkien Gospel Sunday! Rev Samuel Sia will preach on the topic, From Life to Death, from Death to Life! 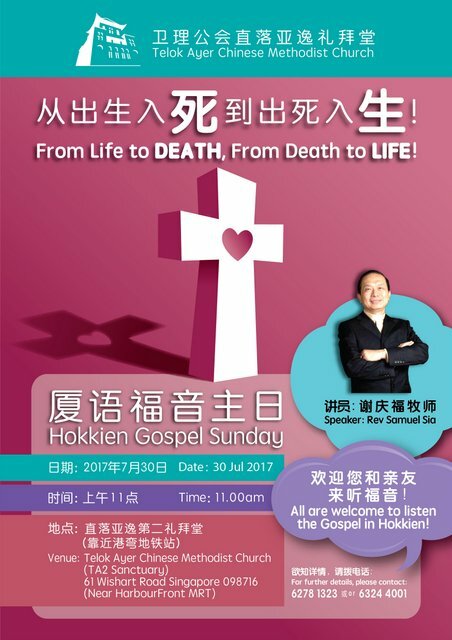 Come and listen to the Gospel preached in Hokkien. All are welcome! Organised by Telok Ayer Chinese Methodist Church. For more information, email admin@tacmc.org.sg or call 6278-1323 or 6324-4001 today.